Self storage can be the perfect solution for storing home or office items that you simply don't have room for in your existing space. Yet even though most storage units are safe, dark and remote, you may want to take extra precautions to protect your things inside. Properly wrapping and packing your items will decrease their chances of shifting or breaking during a move, and help protect them from dust, heat and humidity during long stints in storage. Before you get started, make an inventory of the items you plan to stow away. Use your list to outline the type and amount of packing supplies you think you'll need. You should also know the size of the storage unit you'll be renting. That way, you can visualize which items will be placed where and how they'll stack together. If you find it difficult to determine how many boxes and tape-rolls to buy, purchase too many. It will save you from an annoying shopping trip when you're knee-deep into packing. Most merchants will let you return unused or unopened supplies as long as you save your receipt. Be sure to ask about the return policy. Remember that items may be kept in self storage longer than you expect. It's important to use quality packing products to ensure long-term protection. Even though common household items may save you money, they can also be problematic. For example, many people use newspapers to wrap fragile items, yet newspapers can can scratch dainty things, smudge inks onto items, and even attract insects and rodents. Another common household item people use for storage is plastic trash bags. Unfortunately, plastic retains moisture and can ruin the items inside. Advantages to purchasing card board boxes are that they are durable and clean. These boxes are new and have not been damaged or weakened by moisture, heat, dust, age, or other items previously stored in them. That said, it's always best practice to save and reuse the [undamaged] box that an item originally came in. Besides the benefits to the environment, custom-designed packaging will be a better safeguard for any item. These cube-shaped cardboard boxes are great for stacking dishes, china, glassware and other fragile items. Small cube-shaped boxes, may come with handles. They are designed for holding smaller plates, fine china and other fragile items. Various sizes are tall and narrow, specially designed for holding both lamps and lampshades. These boxes come tall or short, with a bar for hanging clothes to keep them safely spaced for air circulation, and crinkle-free. Lay-down wardrobe boxes can be used for folded clothes, Christmas trees, wreaths and accessories. Various sizes are doubled in thickness for added durability. These boxes can also be used for storing microwaves, computers, stereos and other electronic devises. These boxes will vary in size. Some boxes are all one piece while others are two-part boxes designed so that one box slides over the other box for added durability. Small cube-shaped boxes with flat removable lids, just the right size for storing documents. While it may seem unnecessary to put a mattress in a box, mattresses are highly susceptible to mildew, microscopic insects, and structural damage. Ideally, mattresses and box springs will be stored flat (not on their sides), wrapped in fabric sheeting, and protected in cardboard. Tall narrow boxes designed to hold brooms, mops and vacuum cleaners. Affordable yet durable for heavier items, resist breakage while carrying. Posters can be rolled and placed in tubes to ensure longevity of posters during storage. Single-face corrugated rolls are made from smooth fiberboard on one side. The other side has raised corrugated flutes. This offers great protection for irregular shaped items. Interweave protects against scratches. Corrugated wrap conforms to any shape and absorbs shock. Great for wrapping fragile items that could break. Because colored papers tend to bleed and damage items, they are not recommended for long term storage. Tissue paper is soft and will prevent scratches. Look for acid-free paper when storing vintage textiles, scrapbooks, a wedding dress, and similar precious items. Covers furniture during storage and helps protect it from dust, nicks and scratches. Great for packing lightweight fragile items. Use it to wrap fragile items and electronics. Bubble wrap helps eliminate dust and static. ﻿Make sure that the item is encircled entirely with bubble wrap. 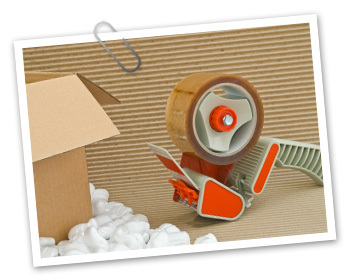 For added security, wrap the item more than once so small moveable objects are sure to remain stationary. Secure the plastic bubble wrap in place with string or packaging tape. Use it to wrap boxes together for added protection during a move. Shrink-wrap can also help protect items from moisture, dirt and theft. Can be placed between fragile items such as dishes for storage. A good, sturdy pair of scissors is must-have for both packing and unpacking. Seal boxes for storage. Tape is available in hundreds of shapes, sizes and brands. For sealing boxes, just about any strong tape will do (except masking tape, which does not age well). But if you're going to apply tape directly to, say, an appliance door, you'll want to choose something that comes off easily without too much residue, like blue painter's tape. Use permanent markers (like Sharpies) to write on boxes and labels. Word to the wise: use code words to label expensive or precious items. It's an added precaution on the very off-chance that a thief breaks in. Use to write on the outside of a box the name of the owner of the box and what is inside. Used to move refrigerators, stoves and other appliances as well as stacks of boxes and similar bulky items.